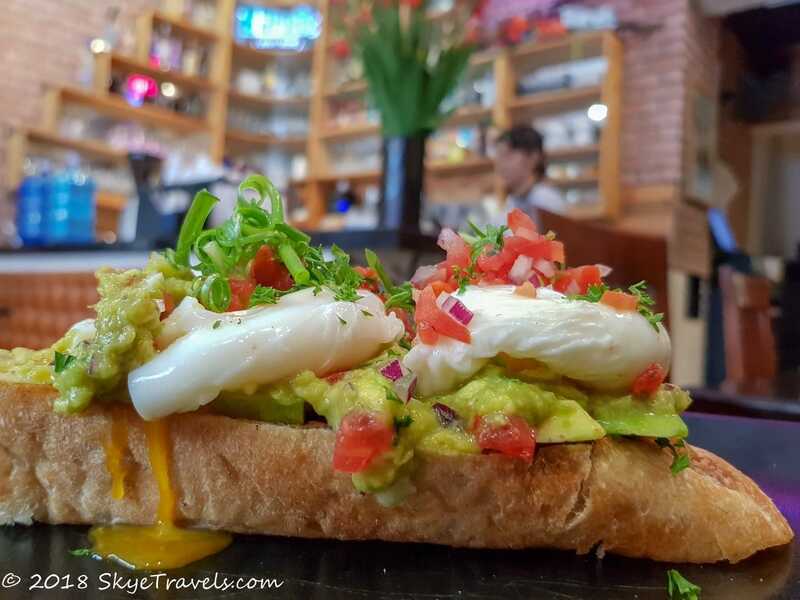 One of my main reasons for traveling the world is trying different dishes, and discovering beautiful cafes and restaurants. Although I’m usually a big fan of the food in SE Asia, there have a been a few places where I struggled to find a dish that I liked, or quality food that I didn’t think would give me a bad stomach. What’s more, I’ve never been a big fan of Vietnamese food. 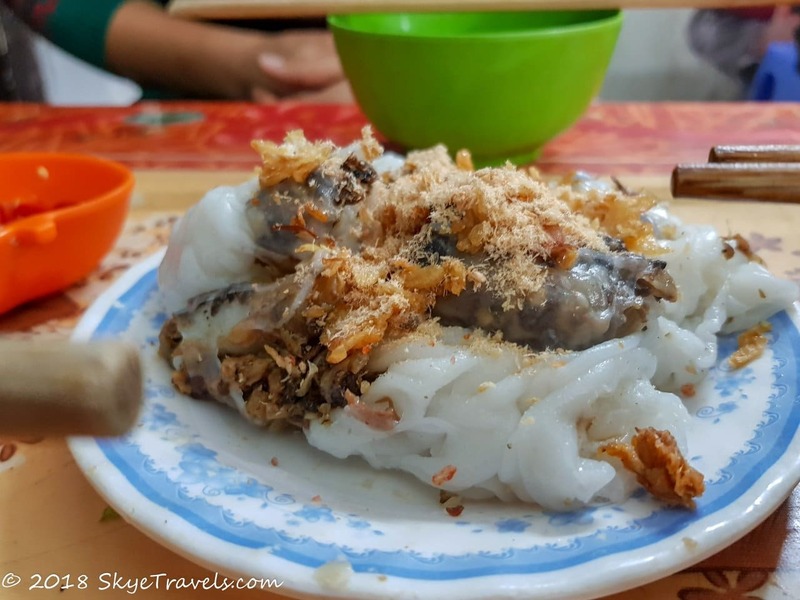 At the beginning of the year, I spent a week in Vietnam and was silly to wait until the end of my trip to take a food tour. However, I did find some really nice meals and restaurants in Hanoi during that week. The first meal I had in Hanoi was bánh rán mặn which translates to savory donuts but is known as Vietnamese meat buns (not to be confused with the famous steam buns). Basic bánh rán are donuts made with rice flour and flavored with sesame seeds. The mặn variant has pork or beef inside. They are triple deep-fried before cut up into a bowl and mixed with pickled vegetables and sweet chili sauce. The next meal I discovered was bánh mì, a.k.a. the Vietnamese baguette. They’re a remanent of the French occupation of Vietnam, but with their own twist using local ingredients. One of the most common flavors is egg and pâté, although my personal favorite was the spicy chicken (not too spicy). Other common ingredients include pickled carrots and cucumbers, lots of cilantro, black pepper and other spices. Vietnamese usually eat bánh mì for breakfast. I found a great restaurant across the street from my hostel and ended up getting one each morning, and for a late night meal a couple of times too. 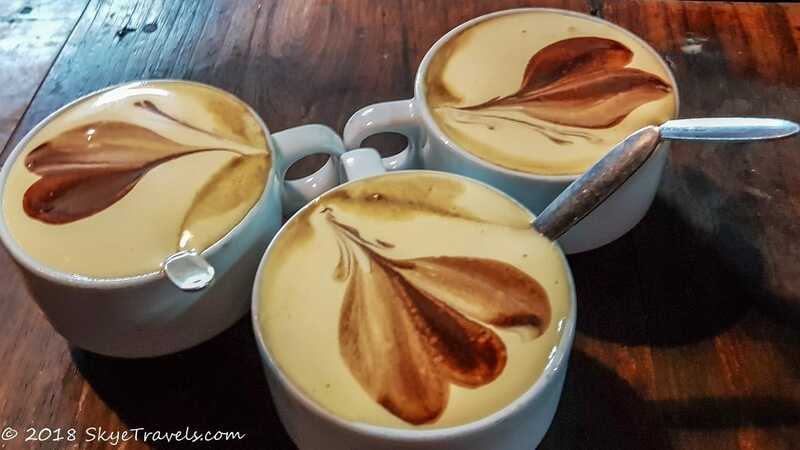 While the Vietnamese name for this drink might not mean much to you, it’s usually advertised in English – egg coffee! The first time I saw a cafe offering it, there was a small part of me that was slightly repulsed but, as I mentioned at the beginning, I always like trying new things. So I figured I’d give it a go. My god, it was delicious!!!! It’s not just a raw egg stirred into a coffee, as you might have imagined (as I did), but rather a custard (egg) topped espresso. Some places definitely make it better than others. I was fortunate enough, while on the street food tour in Hanoi, to be shown the original cafe whose owner invented it. Theirs was unquestionably the best. 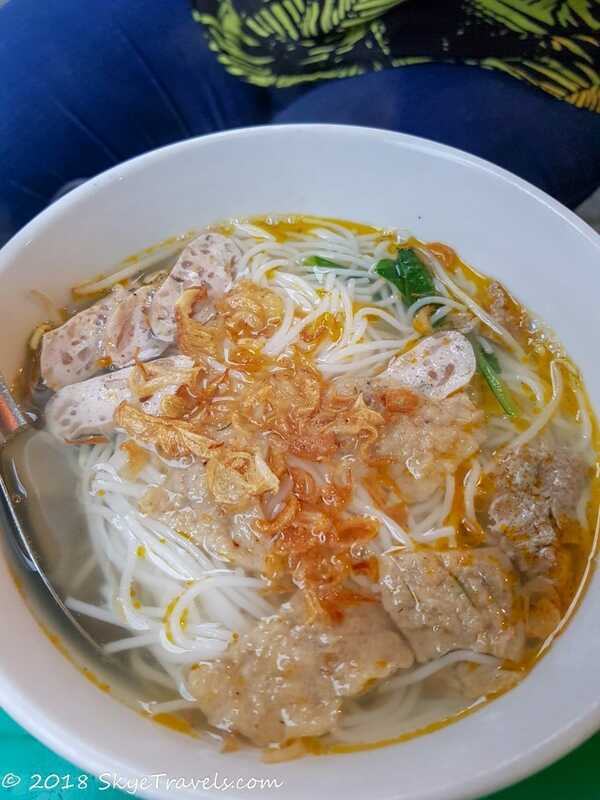 Bun is round rice noodles (also known as Thai or vermicelli noodles), as opposed to phở which is flat rice noodles. Both usually refer to the soup made with their respective noodles. 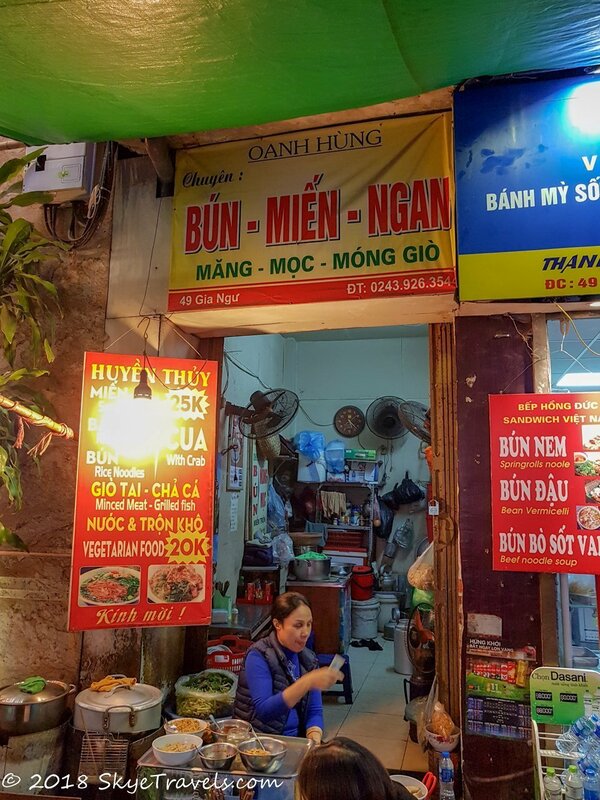 On my fifth night in Hanoi, I stumbled upon a tiny hole-in-the-wall restaurant selling a single dish – bún riêu cua. The lady didn’t speak any English, and it wasn’t until later that I found out the meaning of the soup and how it was made with crab paste, minced meat, grilled fish, vegetables and spices. Yet not knowing what it was didn’t make it any less delicious. I didn’t discover this dish until the food tour and I wrote about it in that article, but I have to mention it here too. Bánh cuốn is defined as steamed rice rolls…but that’s a complete misnomer since it’s not really a roll. Rather, it’s a soft sheet made of rice batter and loosely filled with ground pork, onions and mushrooms. It’s dipped into a fish sauce (more like a broth) called nước mắm pha to which you can add cilantro, pepper and other ingredients to your liking. I didn’t just like it…I loved it!!! 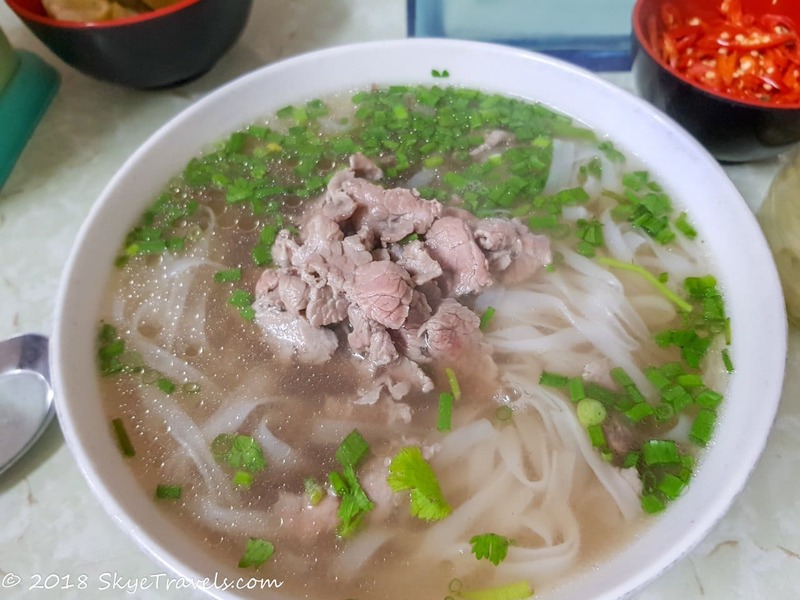 Obviously, I can’t give a list of basic Vietnamese dishes without mentioning the most common – phở, pronounced “fah.” There are two versions of phở: phở bò and phở gà, which just mean beef or chicken respectively. As my tour guide Lan pointed out on the street food tour, the best restaurants only serve beef or chicken, not both. (Don’t tell her I told you as you should take her tour to get all the insider tips.) A lot of people have told me that they’ve had better phở outside Vietnam, but it was an inferior bowl of phở in the USA that put me off enjoying Vietnamese food several years ago. Sure, there are some restaurants in Hanoi that don’t serve great phở. But if you find a good one, it really is delicious. Phở restaurants aren’t the only places which are best if they specialize in a single dish. On my own, I discovered that my favorite restaurants in Hanoi only served one or perhaps two dishes. As you’ll see, some didn’t even have a name and were simply called by the name of the dish that they served. It would be silly to say these are the best in the city, as that’s relative to everyone’s taste. These are simply the best ones that I found; a couple of which were with the help of Lan on the street food tour. This one wasn’t anywhere near the center of town but was around the corner from the first hostel I stayed at in Hanoi. 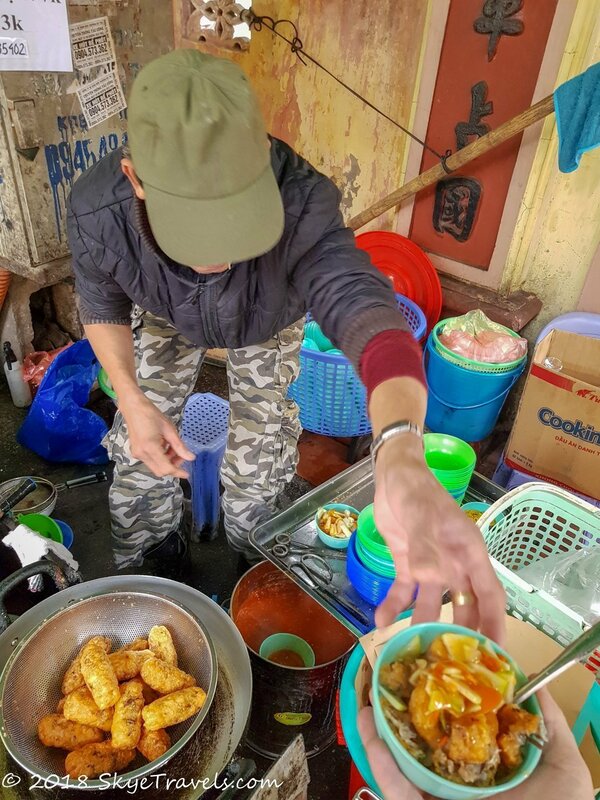 It wasn’t a restaurant, but rather a spot down an alley where a couple guys set up a stand to prepare and serve bánh rán mặn. There’s no official name for the stall beyond the name of the food they specialize in. Google Maps advertises them as open from 9 a.m. to 7:30 p.m., but I went twice during those times and only found a couple grease marks on the ground where the pots usually are. The set up is really interesting. To the side, a couple of women make the savory donuts from scratch and place them in the first pot of hot oil. The guy then moves them through the three pots of increasingly hot oil before putting them in a sieve to drain off and cool down. The regular bánh rán is also available, which is the sweet variation filled with sesame paste. 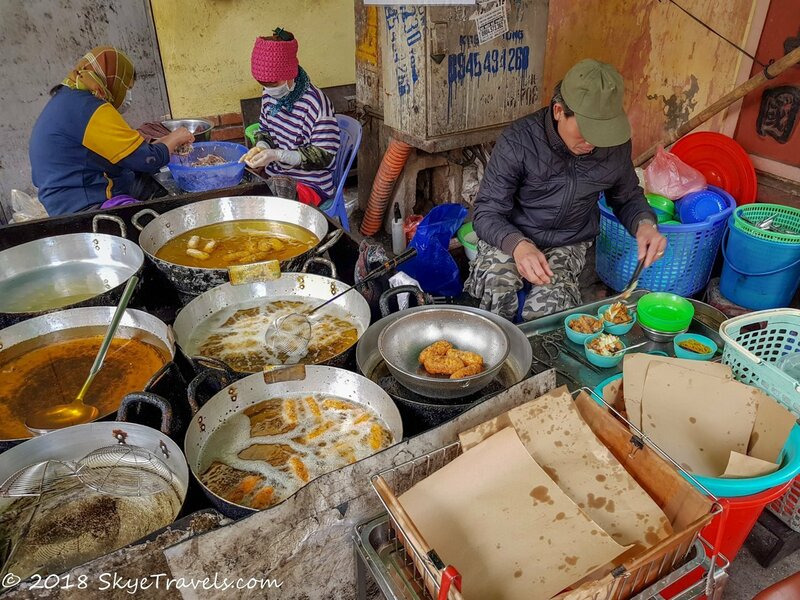 Set up around the pots are a couple dozen child’s chairs you can sit on to eat a bowl of bánh rán mặn, usually two at a time cut up and mixed with pickled vegetables and sweet chili sauce. Across from my second hostel was my next favorite restaurant. I had already tried a couple bánh mì sandwiches around town, but the ones at Banh Mi Hoi An were particularly good. They only had four options to choose from: roast chicken, roast pork, egg and pâté, and the Hoi An special (a proprietary mix of meats that differs between vendors). My favorite was the roasted chicken. It was spicy enough to get my tastebuds going without blowing my head off. 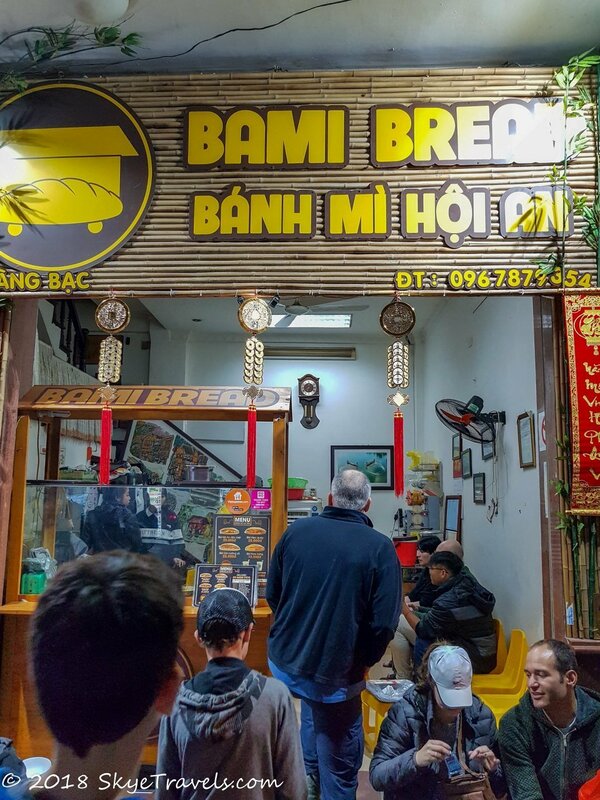 Lan later showed me a much better bánh mì shop – perhaps the best in town – called Banh Mi 25. They are so popular, they’ve taken over two additional buildings to provide more spaces to sit at. There are quite a few options to choose from at Banh Mi 25, but their own Bánh Mì Dặc Biệt (house special) was certainly the best. 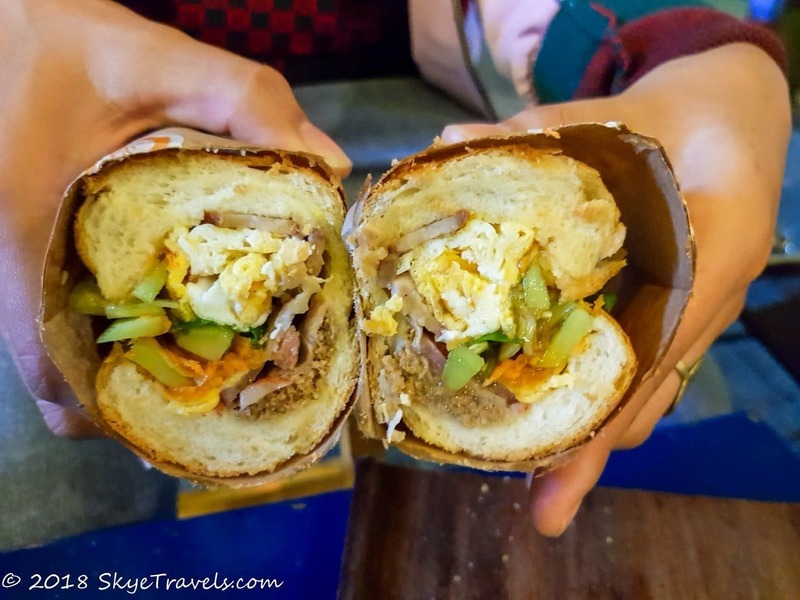 However, that restaurant belongs with the post about the street food tour, so I’m mentioning Banh Mi Hoi An here as an alternate and cheaper option. Halfway through my week in Hanoi, I set off in search of a cheap place to eat a late dinner near the hostel. I still didn’t know most of the different dishes, and not all the photos shown by the restaurants gave me an idea of what to expect. Just around the corner from the hostel, I saw a sign that said something in Vietnamese, followed by the word “crab.” I like crab, so I sat down on one of the few chairs available. The bowl that was handed me a moment later didn’t actually have any crab in it that I could see. I later learned from Lan that it’s made with crab paste, not crab meat chunks. She also said the lady has been serving bún riêu cua there for decades. As mentioned, the best establishments are those serving just one or two items. One thing that makes them even better is longevity, and this place was the best. This establishment shows up every night in the motorcycle parking lot of a local business. They mainly just serve their namesake – bánh cuốn, the steamed rice rolls mentioned above. Once again, the same lady has been running this establishment for decades. I watched her for several minutes making one rice sheet after another, sometimes barely even looking at what she was doing. Just an endless machine pumping out Vietnamese delights. 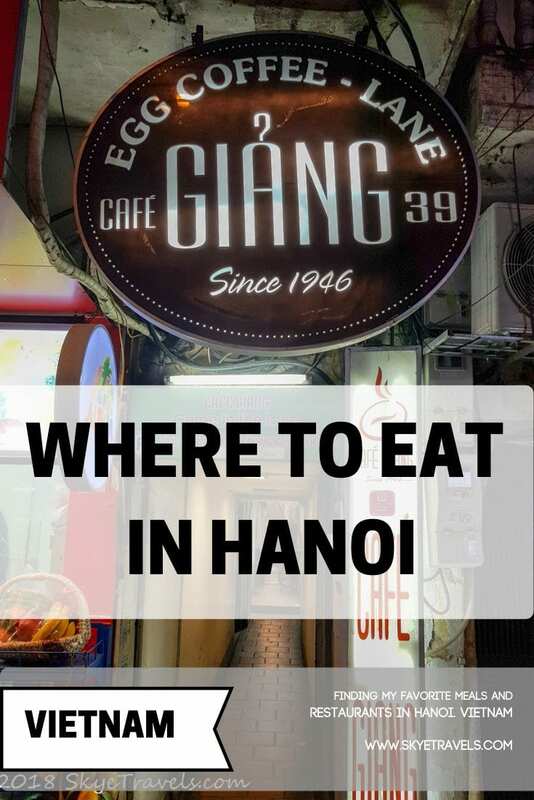 I’m actually bummed that I only ate there while on the food tour, as we had small portions at each of our eight stops (except for the phở). I could easily have enjoyed a full meal of bánh cuốn. As much as I enjoy Asian food, I need my western fix every now and then. In Hanoi, that came in the form of a delicious bacon cheeseburger at Chops. That Western restaurant was just down the street from my hostel. Since 2015, Chops has been serving some pretty impressive food in the heart of Hanoi. They make their hamburger buns fresh every morning and even import their beefsteak daily from Australia which they then mince themselves. 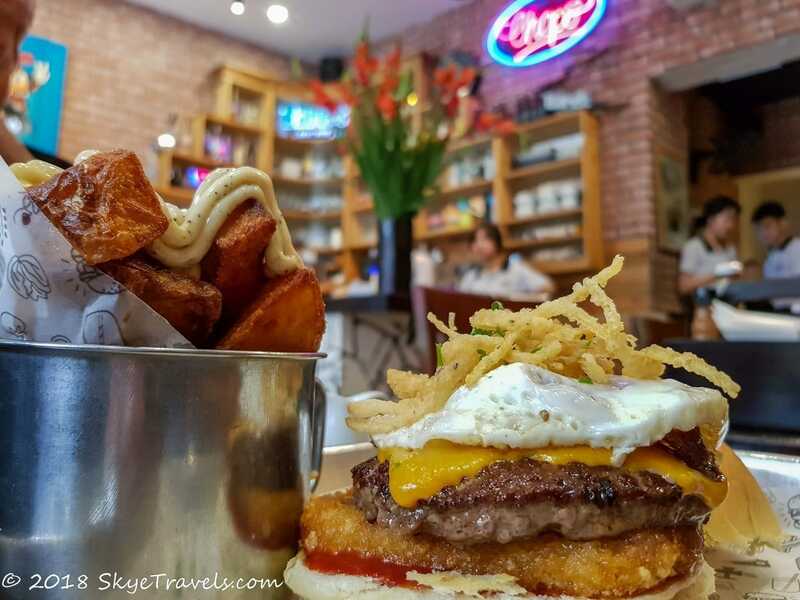 I had their all-day breakfast burger which included a beef patty (something I was dearly missing in Thailand where cows are sacred), cheddar cheese, a hashbrown, smoked bacon and a fried egg. On the side was a delicious serving of triple-fried fat fries, just like they make them in Belgium. The menu isn’t entirely budget friendly, although it’s still cheaper than you’d be spending in most Western countries. However, from noon to 2 p.m. on weekdays, you can get the lunch special – a burger or salad, a side and a drink for only 170,000k dong ($7.35). The brunch menu, served from 8 a.m. until noon on weekdays and until 3 p.m. on weekends, includes several other amazing creations such as French toast and breakfast burritos. I also got to try the smashed avocado and poached eggs on sourdough toast from that menu. Vegetarian options are available on many of their menu items.